Preheat oven at 180ºC. Grease a baking tray with olive oil. Put yeast in a bowl, add castor sugar and 2-3 tablespoons warm water, mix and set aside for 5-10 minutes or till yeast activates. Put refined flour in a planetary mixer. Add 1 egg, yogurt, salt and activated yeast and knead into a soft dough using water as required. Dust worktop with flour, place dough on it and knead with your hands. Dust a bowl with some flour, put dough in it, cover with a cling film and set aside for 5-10 minutes. Heat oil in a non-stick pan. Add onions and sauté well. Add garlic, mix and sauté for 2 minutes. Add mutton mince, mix well and cook, add salt and mix well. Add red and green capsicum, mix well and cook for 2 minutes. Finely chop green chillies and add, mix and cook. Add tomato puree, mix well and cook. Add paprika and all-spice powder, mix well and cook till the mince is fully cooked. Divide dough into equal portions and shape them into large balls. Roll out into oblong sheets and place on greased baking tray. 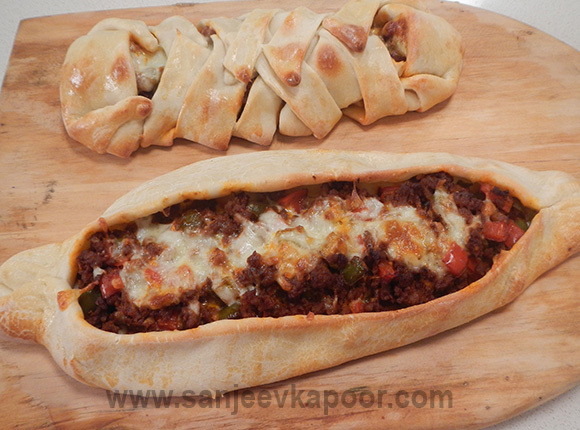 Top with mince mixture and mozzarella cheese, fold the edges inwards and join them at the ends. Make another one in a different pattern and top with mozzarella cheese. Whisk remaining egg and brush the pides with it. Place tray in preheated oven and bake for 15-20 minutes.